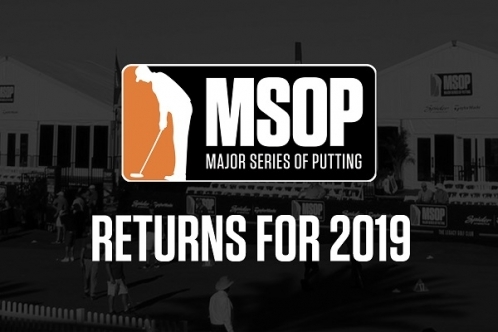 LAS VEGAS, NV (March 27, 2019) — Major Series of Putting (MSOP) today announced the return of the ultimate Vegas golf experience — the MSOP Championships — where anyone can compete and feel like a pro. With over 500 events and more than $1.2 million in cash awarded to date, MSOP is raising the stakes for the 2019 season as it expands its Tour, introduces the season-long Race To Vegas and adds two additional Championship Events. The 2019 MSOP Championships will offer a minimum of 12 events over the course of seven days, giving over 850 golfers the chance to win pro-style cash purses totaling over $250,000. Players are treated to an unforgettable professional experience, competing under the spotlight of the media with national television coverage. The prestigious Legacy Golf Club with two 10,000-square-feet natural grass putting greens will once again set the stage for the Championships taking place October 14-20, 2019 in Las Vegas. In addition to the Stroke Play and Team Championship, MSOP will be adding a second Turbo Singles Event with a purse of $50,000, along with a new exclusive Ranking Race Showdown Event with a $10,000 purse. Players will be racing their way to Vegas this season as MSOP establishes a ranking system, creating a pro tour-style build up to October. Ranking points are awarded to players for every event they play, giving players the opportunity to compete in numerous regional events across North America. The top 20 ranked players on the MSOP Tour who battled it out and accumulated the most Ranking Points throughout the Tour season, will earn a spot in this exclusive event. "In just two years, MSOP has truly established itself as an international spectacle, bringing players from over 12 countries to Las Vegas to compete for pro-style cash purses," said President and General Manager Guillaume Béland. "Recognized as the world's biggest putting tournament, MSOP continues to raise the bar and this year is no exception with new Tour stops, Championship Events, and more prize money up for grabs." Responding to the demand from last season, the 2019 MSOP Tour is set to expand to additional markets across North America and will reach over 15,000 golfers. Each Tour market is comprised of 15 Local Qualifiers and a two-day Regional Final. Outside the official Tour markets, dozens of golfers and courses will be bringing their own one-day qualifiers to a course near them. 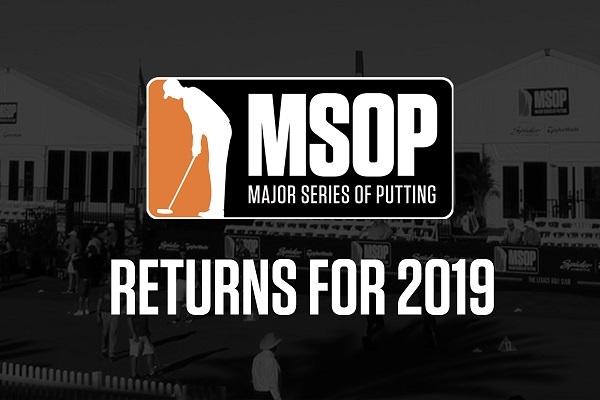 In all, the 2019 MSOP Tour will see more than 150 people qualify for the Championships in Vegas. "MSOP sets the stage for anyone who loves the game of golf to be treated like a tour player, and have a real opportunity to win serious cash," said Aaron Crawford, 2018 Stroke Play, Mini Turbo #2 and Mini Turbo #3 Champion. The 2019 MSOP Tour is underway, making its first stop in Arizona. For more information on the MSOP Championships or to find a Tour event near you, visit MSOP.com. If you are interested in bringing a qualifier to you, please contact tour@msop.com. Major Series of Putting (MSOP) intends to entertain, challenge and thrill people with the simplest and most important golf element — putting. To achieve such, MSOP sanctions the ultimate Vegas golf experience with hundreds of thousands of dollars in total prize money. Participants from around the world will have the opportunity to test their skills first at the local and regional levels, before competing in the MSOP Championships near the Strip in Las Vegas. Participants' skill and composure will be tested as they compete over several days in a high-stakes environment. This stimulating competition is open to all as qualifying events will be held around North America in collaboration with local golf courses. MSOP, a subsidiary of Lune Rouge Innovation, is venture-backed and funded by Lune Rouge — the private equity company of Guy Laliberté, founder of Cirque du Soleil, — which focuses on high potential companies, mainly in the entertainment and technology industries. For more information, visit MSOP.com.